Creating a sustainable industry is an essential part of the future of ATM and to support this goal NATS have developed a flight efficiency and environment management tool – FloSys. The FloSys tool was developed based on our research into flight efficiency which was internationally recognised with the Janes’ ATC Environment Award. Achieving real efficiency and benefits for airspace users requires better understanding of the 3 Dimensional efficiency of each flight. To obtain that understanding, Flosys compares the actual trajectories that aircraft fly, to an optimal flight trajectory. It can then support users in planning more fuel efficient trajectories. FloSys enables users to store and compare historical flight data. The system displays a visual comparison of a flight and compares the actual profile flown with the optimal trajectory to highlight areas for improved efficiency. 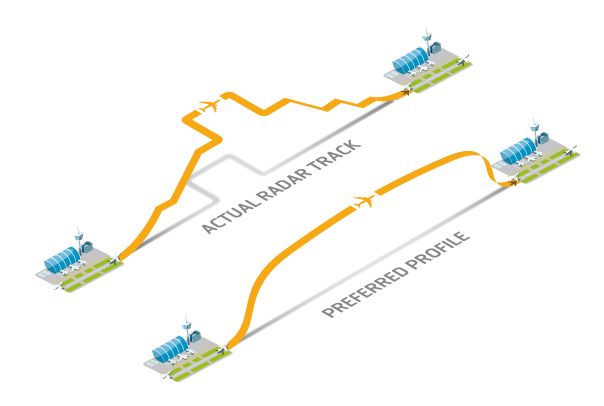 Users are then able to identify steps to improve future flight profiles. Having established a record of performance efficiency, you can then utilise powerful analytics to set targets for improvement and track performance to those targets. Since 2006, through monitoring and improving flight trajectories in UK airspace, NATS has enabled a reduction in CO2 emissions in excess of 1 million tonnes. A fuel saving to airlines of over $200m. Environment. Reduced CO2 emissions throughout the ATM network making air travel more sustainable. Operational Efficiency. Highlighting inefficiencies in airspace, procedure design, and operational practice to enable operational improvements and deliver long-term cost reductions for customers. Reduced Airline Costs. Reduced fuel cost to airline customers by provision of better, fuel saving flight profiles. Real-time Performance. Real-time flight efficiency data delivered to the operation to allow active management of flight efficiency in all conditions. by airline, aircraft, route, sector, ATC Watch and ATC user. 3D Trajectories. Lateral and vertical profile of flights through your airspace with time and sectors in an easy to understand view. Filtering and sorting. Advanced filtering and sorting capability to pinpoint the flight you want. Hotspots. Highlight ‘hotspots’ automatically on each flight profile. Relative Performance. Display multiple flights at once to see relative performance. Flight Performance. Compare any flight to the best real world performance. FloSys unlocks the ability to improve real-time flight performance using an intuitive, feature-rich web solution. deliver further benefits in the future. set of data to highlight flights of interest and help understand unusual performance both good and bad for organisational learning. Network Overview. Visual heatmaps showing sector performance and areas of greatest inefficiency will further support understanding of network performance; focusing investment and tactical decisions on the areas that need it most. Enhanced Analytics. Incorporating more detailed evaluation of trajectory efficiencies to include en-route horizontal track extension, fuel burn and CO2. As well as Continuous Descent and Continuous Climb Operations information. a real time dashboard plugin for integration into existing management dashboards.